Blueberries are sometimes overlooked as options in a colder USDA zone and, if they were grown, were almost certainly hardy low-bush varieties. That’s because at one time it was almost impossible to grow high bush blueberries (Vacciium corymbosum), but new cultivars have made growing blueberries in zone 4 a reality. This gives the home gardener more options. 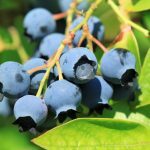 The following article contains information on cold hardy blueberry plants, in particular, those suitable as zone 4 blueberries. Blueberry bushes need a sunny location and well-drained acidic soil (pH 4.5-5.5). With proper care, they can live for 30-50 years. They are a few different types: low-bush, mid-height and high bush blueberries. Low-bush blueberries are low growing bushes with plentiful small fruit and are the hardiest while mid-height varieties are taller and a little less hardy. High-bush is the least hardy of the three, although as mentioned, there are recent introductions of this type suitable for cold hardy blueberry plants. High-bush varieties are classified by either early, mid-, or late season. This indicates the time when the fruit will ripen and is an important factor to consider when choosing blueberries for zone 4. 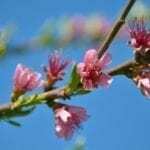 Varieties that bloom earlier in the spring and fruit earlier in the summer can be damaged by frost. Thus, gardeners in zones 3 and 4 are more likely to opt for mid to late season varieties of high bush blueberries. Some blueberries can produce crop on their own and some need cross-pollination. Even those that can self-pollinate will bear larger and more plentiful fruit if placed near another blueberry. The following plants are zone 4 blueberry cultivars in no particular order, except alphabetical. Included are cultivars that are suited to USDA zone 3, as those will no doubt thrive in zone 4. Bluecrop is the most popular high bush, mid-season blueberry with excellent yields of medium sized berries of good flavor. This variety can get rangy but it has great disease resistance and is very winter hardy in zone 4. Blueray is another high bush type with medium sized berries that store beautifully. 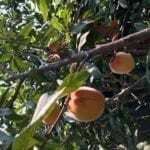 It is moderately resistant to disease and also suited to zone 4. Bonus is a mid to late season, high bush cultivar. It produces the largest berries of all the cultivars on vigorous bushes suited to zone 4. Chippewa is a mid-high, mid-season bush that is a bit taller than other midsize cultivars such as Northblue, Northcoutry or Northsky with sweeter, larger berries and is hardy to zone 3. Duke is an early high bush blueberry that blooms late, yet produces an early crop. The medium sized fruit is sweet and has an excellent shelf like. It is suited to zone 4. Elliot is a late season, high bush cultivar that produces medium to large berries that can be tart because they turn blue before they are ripe. This cultivar is suited to zone 4 and has an upright habit with a dense center that should be pruned to allow for air circulation. An older cultivar (1928), Jersey is a late season, high bush blueberry that is easily grown in most soil types. It also produces a dense center of growth that should be pruned out to promote air circulation and is hardy to zone 3. Northblue, Northcountry and Northland are all mid-height blueberry cultivars that are hardy to USDA zone 3. Northblue is an early producer and is most hardy with a consistent snow cover. 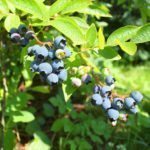 Northcountry berries ripen in the early to the middle part of blueberry season, have a compact habit and require another blueberry of the same species to set fruit. Northland is a very hardy blueberry cultivar with medium sized berries. This early mid-season cultivar tolerates poor soils and does best with a good annual pruning. Patriot, a highbush, early to mid-season blueberry produces medium to large berries that are sweet and mildly acidic. Patriot is suited to zone 4. Polaris, a mid-height, early season cultivar has excellent berries and will self-pollinate but does better when planted with other northern cultivars. It is hardy to zone 3. Superior is an early, mid-height cultivar whose fruit matures one week later in the season than other blueberries in northern regions. It is hardy to zone 4. Toro has large, firm fruit that hang like grapes. This mid-season, high bush variety is hardy to zone 4. All of the above cultivars are suited for growing in zone 4. Depending upon the topography of your landscape, your micro-climate and the amount of protection given the plants, there may even be some zone 5 plants that are suitable for your region. If a late spring frost threatens, cover your blueberries overnight with blankets or burlap.